GEORGETOWN, Guyana -- Following local and regional media reports claiming that the president of Guyana, David Granger has changed his mind about meeting with and holding discussions concerning to the border controversy with Venezuelan President Nicolás Maduro, the government said on Saturday this is not the case. Granger has made no mention of any “change of mind”, the government said in a statement. He merely said that he is willing to speak with Maduro on a variety of issues of common interest, separate and apart from the border issue. Granger has noted that there is much else of importance to be discussed, including trade and stability in the region. That position is a longstanding one and is captured in diplomatic and other correspondence between the two countries. Granger and, subsequently, Maduro approached the United Nations in June and July of this year, respectively, to call for the secretary general to carry out the role set out in the Geneva Agreement. The secretary general has indicated that he is looking into the matter and has asked whether both presidents will be attending the United Nations General Assembly in September. That forum may offer the opportunity for a meeting. Guyana has accepted that approach. According to the government, subsequently, several other entities have also offered to mediate in the matter, apparently acting in response to prompting from Venezuela. “We appreciate the interest and goodwill; however, solutions do not merely rely on goodwill. It is only a negotiation problem if one assumes that no international law governs the issue,” the government said. 1. Many offers seem to start from fictitious provisions in the Geneva Agreement or unsubstantiated assertions like those of Mr Mallet-Provost about the circumstances surrounding the Arbitral Award which established the borders. Many reports are obviously untrue, including one today (Saturday, August 8) to the effect that Venezuela has been challenging the boundaries since 1899 or that the dispute has run for over 100 years. In fact, Venezuela participated in the demarcation of the border between 1901 and 1905 and made no challenge to that boundary until 1962 and 1966 as Guyana was about to become independent. In other words, that border had been unchanged and unchallenged for over 60 years. 2. Over the last few days there have also been reports to the effect that Venezuela approached the United Nations Secretary General to have the Good Offices process implemented in keeping with the Geneva Agreement whilst Guyana has refused to do so and wants to go straight to the International Court of Justice. In fact, the Geneva Agreement makes no mention of the Good Offices process. Obviously therefore, the Good Offices process neither requires the agreement of both parties in order to end its use. 3. Actually, the Good Offices process has been in place for 25 years following other attempts at resolution, including a moratorium under the Protocol of Port of Spain. The latter was unilaterally brought to an end by Venezuela in 1982. Trying to resolve an issue with such disparate actors, well-wishers and complex fora is a recipe for confusion and is unhelpful. 4. Guyana will continue to work with the United Nations and the United Nations Secretary General as set out in Article V (2) of the Geneva Agreement. It has always done so and has never attacked Venezuelan civilians or seized vessels operating in Venezuelan waters or territory. It has never published any maps that are inconsistent with international treaties and law. 5. The Venezuelan President Nicolás Maduro has been campaigning across the world with a message that Guyana has been committing acts of aggression against the Bolivarian Republic. As ludicrous as this may seem to Guyanese, some listeners take this seriously. Some offers to mediate start from that position – keep the rhetoric down. Some offers to mediate have been prompted by that concern. However, neither in English nor Spanish is a speech defined as a more aggressive tool than the actual use of a corvette or gunboat. The recent Decree issued by Venezuela has not been issued out of the blue; it is part of a well rehearsed Venezuelan cycle of combined illegal and diplomatic actions. In 2013, without the presence of Exxon Mobil as an excuse, in Guyana’s exclusive economic zone off the North West coast of Guyana, Venezuelan gunboats seized a seismic survey vessel carrying out peaceful survey work. The Government in office at the time was the PPP. The fact that our protest about Venezuelan actions, which are clear breaches of international law, can be regarded as aggressive should tell observers and Guyanese about how the Venezuelan government regards the people of Guyana and their rights under international law. • It does not change any land boundaries that existed before 1966 or thereafter, whether the Essequibo or the estuary of the Orinoco to Guyana. • It defines no territory and its people as being disputed and therefore not deserving of development. • It gives Venezuela no right to send military vessels or quasi-military groups or anyone else to occupy territory that is part of the sovereignty of The Cooperative Republic of Guyana and reaffirmed as Guyana’s by the 1899 Awarded. • It does require the parties to deal with the controversy that has been brought about by Venezuela’s unilateral and unsubstantiated contention that the Arbitral Award of 1899 is null and void. It needs to be said therefore, that the controversy can only be resolved if Venezuela either makes a legally acceptable challenge on the nullity of the Arbitral Award or drops it. 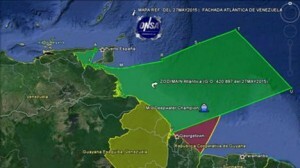 If it is able to make its case, it would not follow that it would now be awarded the Essequibo. What it means is that the entire case will then have to be adjudicated since just as Venezuela claims territory that is fully part of Guyana today, the British – with evidence – prior to 1899 claimed territory that is part of Venezuela today. Therefore it would need to be acknowledged, on Venezuela’s part, that Guyana would then have the right to have British claims to parts of the territory now controlled by Venezuela, also considered. The fact that in 58 years Venezuela has never seriously attempted to support its claim which gave rise to the controversy is a clear indication that having pressed for arbitration and gained the mouth of the Orinoco and much else, it has subsequently, on reflection, after gorging itself on the riches of that grant decided to secure more territory by other means – essentially by keeping attempting to keep a dead controversy alive and using those riches to prevent development in Guyana. 1. The present tensions between Guyana and Venezuela are neither the making of the present government nor the previous administration of Guyana. It is a tension of Venezuela’s own creation because there can be no doubt that the concession being operated by ExxonMobil and other concessionaires under license from Guyana, are in territory that is Guyana’s under any correct interpretation of international law. 2. The ExxonMobil licence dates back to 1999 and its search for hydrocarbons predates this current administration. It cannot therefore be part of any new aggression plot under this government. 3. While Venezuela takes the position that the secretary general cannot choose another means of settlement of the controversy without the agreement of both Guyana and Venezuela, there is no support for that interpretation in the Geneva Agreement. Article V (1) of that agreement clearly spelt out the options from which Guyana and Venezuela could choose if the Mixed Commission fails to resolve the controversy. Article V (2) clearly states that, in the event of failure to resolve the controversy under Article V (1), the secretary general is mandated to select a means of finding a solution – that is one of his choices. It was in anticipation of the current position in which Guyana and Venezuela cannot agree on a means of settlement that Article V (2) was included. That latter provision would be unnecessary if Venezuela’s position were correct.